Max Harris was a glamorous young Australian poet who was making a reputation for himself as something of a rebel as editor of Angry Penguins, a cutting-edge literary magazine. Harris wanted to shake up the artistic community by exposing it to new ideas and new writers, and in 1944 he thought he had found a writer worth taking under his wing. That writer's name was Ern Malley. Harris never actually met Malley. Instead, he received some of Malley's poems in the mail from a woman claiming to be Malley's sister. Ern himself had, it seemed, died of Graves' disease and his sister said that she had found the poems while going through his possessions after his death. The poems were strange, dark, brooding, and almost incomprehensible. They contained lines such as "I am still the black swan of trespass on alien waters." 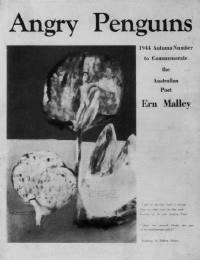 Harris loved them, and he arranged for a special edition of Angry Penguins to be devoted to Malley's work. There was just one problem. Ern Malley didn't exist. He was the satirical creation of two Australian poets, Harold Stewart and James McAuley, who were hostile to modernist poetry and wanted to see if they could get the literary world to accept "deliberately concocted nonsense." They later claimed to have written the poems in one day by randomly picking out nonsequential lines from the Oxford Dictionary of Quotations. Harris's reputation and ego took a blow when the Ern Malley hoax was exposed. But Stewart and McAuley didn't come out of the hoax as heroes either. Many readers insisted they enjoyed Malley's poems and argued that the two poets had unintentionally produced better work than they were capable of when trying to be serious. Not knowing then that Durer perceived it too. A splash -- white foam in the dark! Heyward, Michael. (1993). The Ern Malley Affair. Faber and Faber.